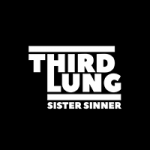 Share the post "EP review: THIRD LUNG – Sooner Or Later"
Third Lung hail from Reading and in their four years to date have picked up rave reviews including BBC 6 Music’s Steve Lamacq. Third Lung consist of Tom Farrelly (vocals, guitars), Camilla Jurasek (guitars, vocals), Rob Jacques (bass) and Sam Waugh (drums) and have a number of live shows under their belts. ‘Sister Sinner’ opens the EP with intent, a fantastic mix of chiming guitars and a driving bass line, topped off by the impressive vocals of Tom Farrelly. The band’s in your face sound and melodies would go down well with say fellow modern rockers Those Damn Crows fan base. ‘Can’t Be Taken Back’, with its stadium rock sound, has the swagger of say U2 and a chorus made for singing along to live. The guitars create a wave of melody, whilst Tom Farrelly has the vocal range bringing to mind Muse’s Matt Bellamy. For four musicians they create a massive wall of sound. Shades of the Killers on ‘Sooner Or Later’, which was released as a single in November last year, and it has a hook that just won’t let go. Indie rock has rarely sounded so good. ‘While You Sleep’ is the least ‘instant’ song of the four, yet it grows on repeated plays. The backing vocals and drum rhythm are particularly impressive. How did Third Lung get together? Tom met Cams at Reading College and they played in bands together for a while. Tom was actually the drummer back then. Whilst working on some of Tom’s own material he got in contact with Rob through a friend and hasn’t played with another bass player since! Sam and Tom knew each other through close friends, and he was playing in a function band at the time who were gigging all over the UK. They eventually got in touch and the rest as they say is history. For someone new to the band how would you describe your music? It’s emotionally driven music for sure. With a strong lead vocal that draws you in. Accompanied by punchy riffs, elegant basslines and tight drum grooves. The band have all previously been involved in a variety of music projects before, we’re not shy and openly invite all of our unique styles and influences into the mix. It’s what makes the songs and sound what it is – it packs a punch. You have a new EP due on March 1st. When recording an EP do you record more songs and whittle it down to four, or do you have four songs written and that is all you? We have been working with our producer Michael Smith (RYP Recordings) for some time now and have recorded a lot of material with him in the studio. We decided to pick 4 tracks for this EP that worked well together. The 4 tracks complement each other and lyrically we see the EP as having 2 sides, both circling around 1 common theme – choice. How important is it to have a YouTube video to go with any new music? We have two videos for the singles,’ Sister Sinner’ and ‘Sooner Or Later,’ Which are essential to promote the music and single releases. Social media is really important and anything visual is definitely helpful to engage with your fans. How is the current live scene in the UK? Is it still thriving for newer bands like yourselves? There is so much live music! Whether it’s acoustic mic nights, function bands, touring bands, original bands, festivals you name it you’ll find it in any town and city in the UK. Some of our beloved venues have sadly closed down but the music scene is organic. It’s changing all the time, so we have to keep up to speed with current venues and promoters. If you could tour with any bands, who would it be and why? What a question! We have a lot of strong influences and bands/artists we love! To tour with any of our hero’s would be an honour. What are the band’s plans for 2019? After we release the Sooner Or Later EP 1-3-19, we’ll be working on a load of new material before the summer which we are really looking forward to. Some exciting festival announcements coming soon too. Details are yet to be finalised but come the autumn we’ll be sharing new music. It’s gonna be a great year! This entry was posted in ALBUM REVIEWS (Mobile), All Posts, INTERVIEWS, Interviews/Rising Stars, Single and EP reviews and tagged EP, indie rock, interview, melodic, review, Rising Stars, rock, Sooner Or Later, stadium rock, Third Lung, Those Damn Crows, U2. Bookmark the permalink.